The featured photograph is of a secondhand plumbing store in Brockton, Mass. circa 1940. Unfortunately, it could easily be mistaken today for any number of Erie's secondhand stores south of 26th street on the city's east and west sides with one notable caveat: The store in Brockton seems to have some modicum of organization to its outdoor wares. In a post last Friday, ER Managing Editor Ben Speggen noted City Councilwoman Jessica Horan-Kunco's apparent concern with graffiti -- even sanctioned graffiti -- on city streets because of its effect on the city's aesthetic to out-of-towners passing through Erie. Certainly graffiti as vandalism is problematic and needs to be addressed in any number of ways. But attacking various forms of urban art because of the potential offense to visitors seems rather short sighted given the fact that the number of secondhand stores that are no more than supremely unglorified flea markets appears to be on the rise city-wide. 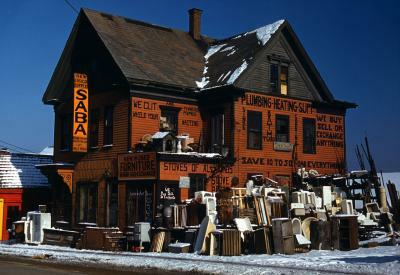 As stores like this become more frequent throughout Erie, where proprietors move the contents of their stores and storage units onto city sidewalks under unprofessional, homemade signage, it seems that it would behoove City Council to undertake the passage of ordinances that control such abuse of public space and the resulting aesthetic crisis it engenders. If such ordinances are already on the books, it would behoove city officials to enforce such laws. Before the free enterprise crowd gets on their high horse, this isn't about the business. It's about the look of the business. We should all have a stake in that. Everyone loves a deal or a great antique find, but the perpetual pickerism in this city nears epidemic proportions. If the aesthetic of the Gem City is in question, let's start by putting on a good mask. Let's require professional signage and control how and what is displayed publicly. There seems to be little reason that a downtown store needs to display a Don Ho album, a computer tower that runs Windows 95, and a stack of bald car tires on the same corner. Fred Sanford was a charming character, but I bet he made for a terrible neighbor.